Henley Rowing Club’s junior section competed at Hampton Junior Head last weekend. The race took place over a 2800m course in challenging weather conditions with a strong, chilly wind making less protected sections of the course difficult. This event is one of the most popular and well competed events of the junior heads season with over 440 entries coming from as far afield as Bristol, Chester and Northwich. It offers crews an opportunity to assess where they stand relative to other clubs and schools from around the country against whom they will be competing at national heads and regattas in the coming months. Henley Rowing Club entered 25 Crews, coming away with seven wins and a further 8 crews placed second or third. The boys squad achieved one win in the J16 double, and two third places in the J16 and J15 quads. 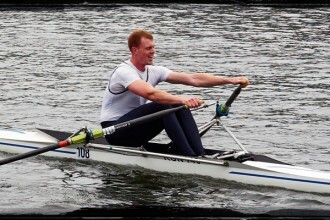 The J16 double of Cameron Jones and Bruce Turnell won their event in a time of eight minutes 27 seconds, a time which would have given them a highly placed sixth in the J18 event. The J15 coxed quad of Henry Peters, Balthasar Issa, Tom Crook, Jack Spiers, coxed by Sam Bell competed in a field of 25 finished behind the City of Bristol Rowing Club and Walton Rowing Club in a time of 8 minutes 24 seconds, missing out on second place by only 0.6 seconds. The women’s J18 eight of Charlotte Orr, Ella Morgan, Lily Stimpson, Clare Pearson, Georgia Edwards, Lauren Kay, Florence Wiggins, Georgina Robinson Ranger, coxed by Ella Nolson, won their event in a time of 7 minutes 59 seconds, beating Nottingham Rowing Club by a margin of 12 seconds, with local rivals Marlow finishing in third place. The WJ16 eight finished in second place less than 2 seconds behind Lady Eleanor Holles School, joint hosts of the event, and the WJ15 eight finished third 15 seconds behind winners Latymer Upper School and 0.7 seconds behind Lady Eleanor Holles despite one of the Henley crew catching a crab which left the boat stationary for a few seconds. In the fours events the WJ18 coxless four finished second less than two seconds behind a very good crew from Lady Eleanor Holles School. 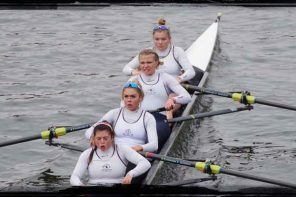 The WJ16 coxless four of Rebecca Lister, Isabel Jonsson, Grace Johnson and Ruby Brown went one better to won their event, as did the WJ15 coxed four of Caoimhe O’Donohue, Amelia Crick, Sophia Hahn and Felicity Parfitt coxed by Emeline Warner. The girls squad also came away with a brace of wins in the WJ18 and WJ16 doubles. The older crew of Ella Morgan and Charlotte Orr beat 20 other crews in a time of eight minutes 49 seconds, with the J16s wining their event in a good time of nine minutes and 8 seconds to make them the 6th fastest girls double on the day, beating most of the crews in the older age group. Both crews shortly head off to Boston, Lincs, to compete in trials for national squad selection. The J14 boys also put in a creditable performance, with the Octuple of David Rechner, James Wallace, Sam Beattie, Grant Taylor, Edward Roy, Alex Carr, Euan Turnell, James Swinburn, coxed by Charles Washbourn finishing an excellent fourth in a field with 23 entries. All other crews in the Octuple event were from schools, against whom clubs often have difficulty competing as the schools have a considerable larger pool of athletes to choose from. The outstanding performance of the day from the younger girls came from the WJ14 squad, who came first and second from a field of 16 boats in the coxed quad event, beating Headington School into third place. 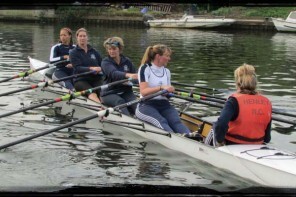 Freya Jonsson, Georgia Brown, Hazel Drury and Amber Weller, coxed by Ella Shute. Pingback: Tema 3: Funciones de la dirección.